Denominación de Origen: Ribera del Duero. Lugar de Procedencia: Roa. Entrega en 24 horas en toda la península. With this Valdehermoso Roble wine we wanted to convey the deep-rooted connection between the wine-grower and the land. Valdehermoso is one of the terroirs belonging to the Esteban family and is situated in Roa at an altitude of 825m on sandy chalk soil. This wine has been aged for 6 months in French oak barrels in order to bring out the special merits of our own ‘Tinta del País’ grape variety. 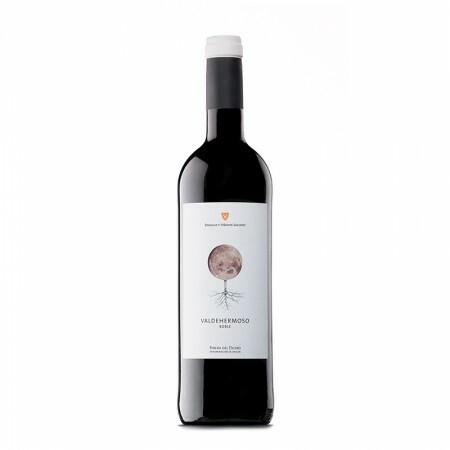 Valdehermoso is a red wine that is distinctive due to its varietal character, with intense aromas of well-ripened wild fruits, peppered with spicy aromas and subtle toasty touches that blend in well. In the mouth it is very rounded and easy-going on the nose, with a lot of body arising from the smooth tannins. It is also very fruity, with a very good integration of fruit with wood. A tasty, lingering finish that is not astringent makes you want to drink more. TYPE OF WOOD: 80% French oak, 20% American oak.